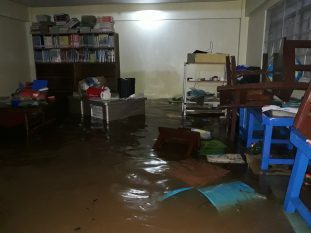 An elementary classroom flooded on the PNC campus. Winds of over 127 miles per hour and gusts of as much as 189 mph tore through the landscape. Rice and corn crops worth an estimated $177 million were destroyed, and 450 homes were damaged, with flooding in nine provinces.